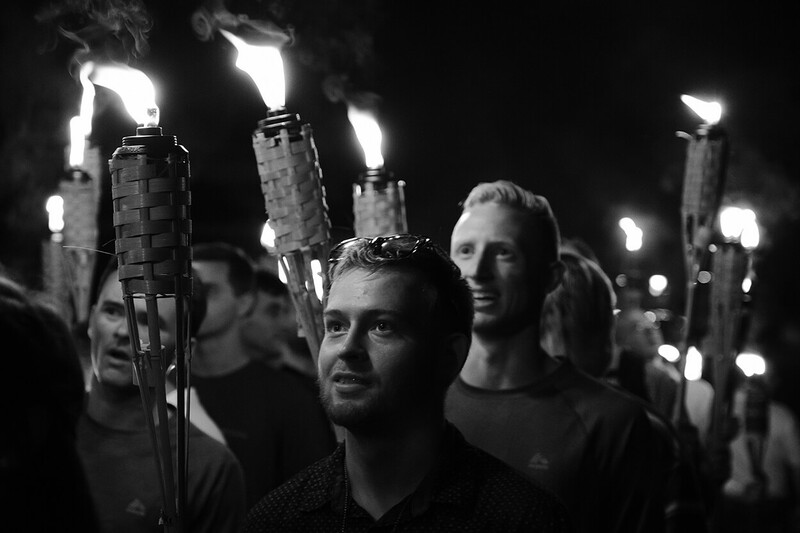 White supremacists gather for a torch-lit march at the University of Virginia, the night before the August 12 “Unite the Right” rally. Photo by Daniel Hosterman. “Doesn’t look like there are many of our people here,” my friend whispered as she sat down beside me. She’s black; I’m brown. We were in a large auditorium, in a city not our own, surrounded by white people. “Eight,” I whispered back to her. “Actually, nine, now that you’re here.” She glanced at me, tilting her head, and replied, “So, you count, too?” I nodded as we both sighed, relieved to find an island of color as whiteness flooded the room. To be a racial minority involves the constant negotiation of bodies and speech—to notice the meaning of my skin in relation to yours, to discern the value of my tongue among the languages and accents echoing in a room. Do I belong here, I always ask myself, in this language, among these people? The power of whiteness first imposed itself upon me when, as a child, border patrol agents detained my family at a checkpoint on Interstate 8, amid a desolate stretch of Californian landscape. They took my Colombian father away for questioning while my Costa Rican mother looked after my sister and me. We waited in the parking lot, watching the police dogs sniff our van, our seats, our backpacks. La migra was white; we were brown. Accents rendered us suspect. Our color made us eligible for interrogation. The dogs and their masters taught me my racial difference, there, on the side of the highway. If that was my baptism into the racial world of the United States, then the white supremacist rallies this year have been my confirmation—collective proclamations that I am submerged in whiteness as racial dominance, public testimonies that I am inundated in ethnic nationalism. That’s what I saw in scenes from Charlottesville in August, in the flood of white faces aglow from their torches. That’s what I heard in their chants when I watched videos of the Unite the Right rally: “Blood and soil,” they howled, claiming a homeland for their family trees. White supremacists march across the UVA campus, chanting “You will not replace us! Jews will not replace us!” and “Blood and soil!” Photo by Daniel Hosterman. An enemy has to be named as such. And white supremacists have named me as their enemy because I am a member of peoples with bodies and languages foreign to their European identities. I am their enemy, and not the sweet white woman, because it is my peoples whose genealogies are deemed impure and reckoned as a threat to their ascendancy. On UVA’s campus the youthful men in their polo shirts and khaki pants named their opposition to my existence: “You will not replace us,” they roared in the streets. The slogan comes from the ranks of a grassroots organization, Identity Evorpa, whose agenda includes a demographic war, the establishment of a ninety-percent white population in the United States. Klansmen no longer hide behind masks when they offer their xenophobic liturgies. The regalia of the Ku Klux Klan are out of fashion, unnecessary. Ethno-nationalists just wear their white skin now, a mask that hides nothing. Racial supremacists have commandeered white faces as their hoods, whiteness as their robes. These days, I study the gestures of the man beside me at the grocery store, wondering if he wore his polo shirt because he’s on his way to one of their marches. I wonder if his white skin is a robe covering a desire for my eradication—as if, given the opportunity, he would sacrifice my own body to the masses, as a ceremonial offering of racial cleansing. After the rally in Charlottesville, white skin means danger, bodies marked as threat. Now, when I’m alone in a crowd of anonymous whiteness, a panic surges through my brown body. My gaze darts from one person to another, desperate for a familiar face. My mind spins, my chest tightens. I see torches in their hands and hear those Virginia chants surrounding me, whispers from everywhere and nowhere, incantations for my disappearance. If you are black or brown, navigating the recent emergence of unmasked ethno-nationalist frenzy requires everyday vigilance—as we have always known, yet now intensified. We’ve grown up aware of people who would prefer for us to keep our distance from their jobs and culture, from their schools and lives. The rallies have emboldened their demands for dominance, the sovereignty of their whiteness, which they wear as a threat to our daily existence. If you are white, know that your body has been snatched from you by white supremacists. They have taken control of what your skin means when we exchange a glance on a sidewalk. David Straughn describes the shock and trauma of seeing terror hit his hometown.